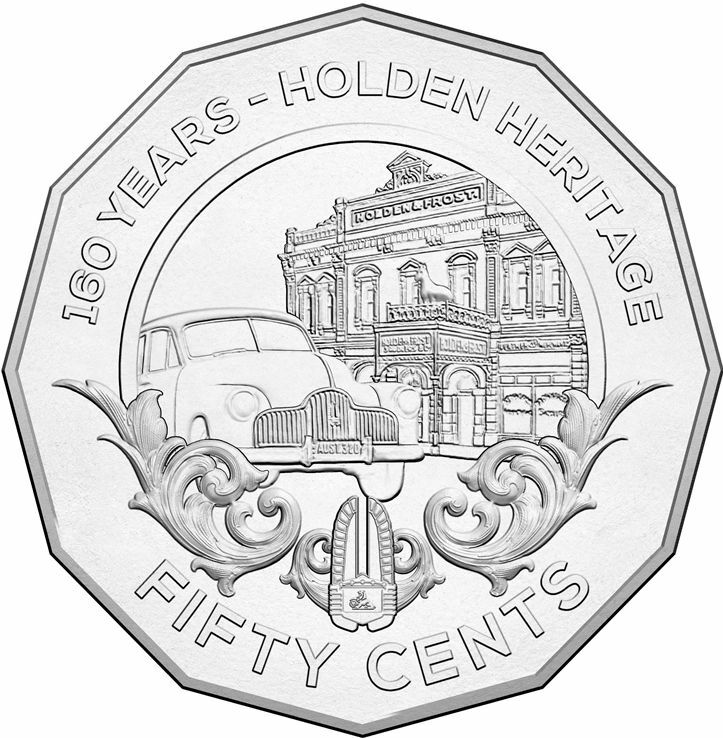 2016 celebrates 160 years of Holden, the iconic Australian car manufacturer and this milestone is commemorated on twelve collectable 50 cent coins minted by the Royal Australian Mint. From its beginnings 160 years ago in saddlery Holden has manufactured car upholstery, tram cars, weapons, aircraft and engines. Holden produced its first all Australian motor vehicle, the FX Holden in 1948. The recognisable shapes of the FX (model number 48-215), FJ, FE, FC, EH, FB, HK Monaro, LJ Torana, HQ Monaro, HX Sandman and Commodore adorn colour printed cupro-nickel 50 cent pieces that look into Holden’s history as creator of the classic Aussie car. The Elizabeth Holden plant in Adelaide will stop manufacturing its last Aussie grown car, the Commodore in late 2017, bringing to a close an era of Australian made motoring history. You can see (and enjoy) these classic cars with a visit to the National Motor Museum in Birdwood, SA or the National Holden Museum in Echuca, Victoria. If getting out and about isn’t your thing you can sit and gaze at the teeny tiny pictures of those same Holden cars on your new collection of colourised 50c coins. Honestly we’d rather get to one of the museums and sniff the oil and vinyl upholstery but the coins are pretty neat either way. The Royal Australian Mint has issued a collection of fifty cents which include the FX, FJ, FE, FB, EH, HK Monaro, HQ Kingswood, LJ Torana, HX Sandman and VC Commodore. 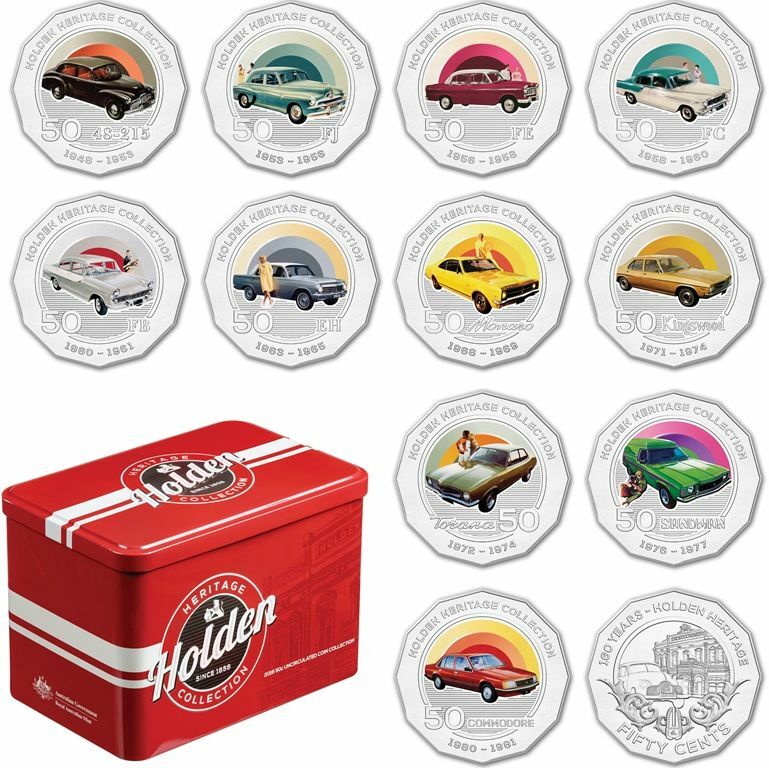 Each coin in a collector card can be purchased separately or in a tinned set which includes a special bonus coin celebrating 160 years of Holden Heritage. There are 11 individual coins depicting each model mentioned plus the bonus coin. If you’ve owned a particular Holden in the past you might like to just get the coin representing that car, or if you’re a dreamer who can never actually afford to own all of these classic Aussie cars then you can splash out on the whole collection. The tinned sets were quick to sell out in the Mint’s e-shop but were available at the Mint Condition Car Show in the grounds of the Mint in Canberra on Saturday 20th August, 2016. Limited stocks will also be available at the Bathurst 1000 on 6-9th October 2016. The bonus coin (seen below) is only available in the retro-tin sets so is limited to a mintage of 7,500.